Wolf Marshall is a unique hybrid. He is internationally acclaimed as both a guitarist and educator. Through his many products and publications, Wolf has gained an enormous worldwide following and status usually accorded only to “famed players” in “name bands,” and has been listened to on his recordings by more aspiring fretboard enthusiasts than most so-called guitar heroes. 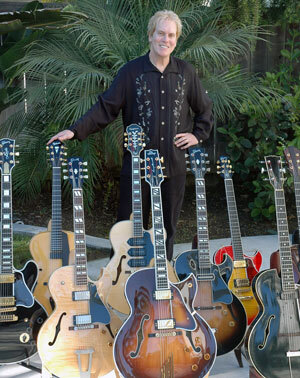 Wolf has been rightfully nicknamed the “Rich Little of Guitar.” He is the leading “impressionist” in the industry, emulating, on record, the styles of the greats with unerring accuracy. And not only does he perform the most challenging licks and tricks of players like Pat Martino, Stevie Ray Vaughan, Eric Johnson, B.B. King, Jeff Beck, Wes Montgomery, Eddie Van Halen, Eric Clapton and countless others on his best-selling book/CD packages, but he explains and demonstrates their special techniques and approaches to legions of guitar students globally. Wolf set the standards for modern guitar education in the 1980s. Then, his innovative transcription books, audio “licks” releases (on Star Licks, Music Sales, and Cherry Lane labels), and videos created the basis for an industry that continues to boom today and shows no signs of abating. He is also a highly respected music author, contributing long-running articles and columns to Guitar World, Guitar for the Practicing Musician (Guitar), Guitar School, Guitar Edge and Jazz Improv since 1984. Wolf’s regular column “Fretprints” has run every month in Vintage Guitar for the past eleven years. Moreover, music magazines in France, Germany and Holland as well as domestic newspapers such as the Wall Street Journal and the New York Times have interviewed him as a celebrity educator and music expert. Wolf Marshall’s GuitarOne was another milestone. Never before in history had a major music magazine borne the name and likeness of an individual or embodied one’s personal approach to the instrument in its pages. Wolf created the format, served as its editor-in-chief and managed the magazine’s content in its first three years. Wolf’s personal approach to instruction is fully exploited in the Wolf Marshall Guitar Method and Power Studies. This is a comprehensive eight-volume, book/audio series (Hal Leonard Publishing) that is considered by his peers and those who follow his teachings to be the absolute state-of-the-art in contemporary guitar music education. Wolf commands an enormous online audience. His online presence was highlighted with his participation with Riff Interactive and content development for Paul Allen’s Experience Music Project in 1999 and 2000. He hosted live online shows for EMP that featured luminaries Hank Garland, Steve Lukather, Albert Lee and many others in this period. Between 2003 and 2006 Wolf produced a vast body of work in multi-media form for Line 6’s Guitar Port Online web site. Wolf’s video instruction is currently featured in the star-studded Guitar Instructor web site. Recommended by the legendary jazz artist Kenny Burrell, Wolf has been on the faculty of the UCLA Jazz Department since 2007. He currently teaches Jazz Improvisation and guitar master classes in the Ethnomusicology section of the university. In the past, Wolf has worked closely with a number of manufacturers, and featured their instruments prominently on his recorded releases and in public performances. He has endorsed, and been endorsed by, prestigious companies such as Fender Musical Instruments, Heritage Guitars, Sadowsky Guitars, Gibson USA, Martin Guitars, Paul Reed Smith, Thomastik-Infeld, Jim Dunlop, Acoustic Image, Raezer’s Edge, National Resophonic, and Dobro, as well as Takamine, Line 6, Kahler, Gitane, Akai, Gemini and Digitech.